After a long summer writing about islands and migrations, this weekend I’ll be back on the road, and on the sea. 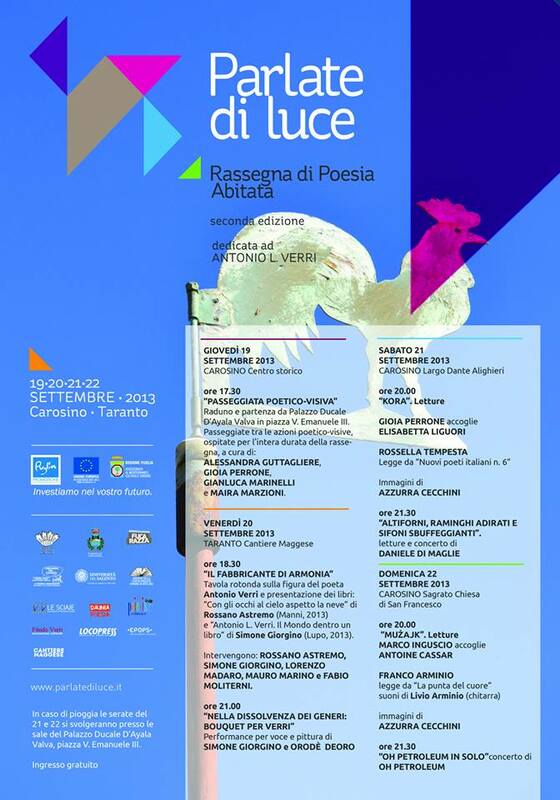 On Sunday 22nd, I’ll be in the village of Carosino, Italy, for the second edition of the festival Parlate di luce. After reading a couple of multilingual ‘mosaics’ (for old times’ sake), there’ll be a recital of the Passport poem, in Maltese and in its Italian adaptation by my good friend Biagio Lieti. Puglian artist Azzurra Cecchini (who has drawn some fantastic heart-shaped maps of her home town, Brindisi) will be projecting live drawings during the recital. Donations from the sale of the Passaporto will be passed on to Associazione Intercultura e Mobilità, a grassroots association based in Rome, working for the promotion and development of opportunities for young members of society from Italy and beyond. The following weekend, on Saturday 28th, I’ll be home in Malta, to present a new poetry booklet at an event celebrating the European Day of Languages, organised by the Għaqda tal-Malti on behalf of the European Commission Representation. 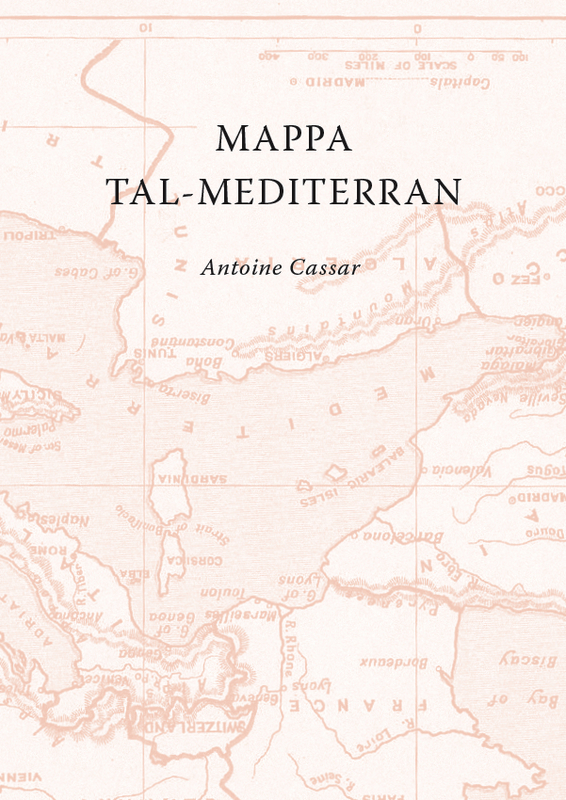 Mappa tal-Mediterran is a poem in 16 stanzas, describing the shapes of the Mediterranean Sea, its coastlines and some of its major and minor islands, in relation to the early and modern histories of the Mediterranean peoples. The booklet, designed by graphic artists Marco Scerri (cover and typography) and Rafael Rivera (inside maps), is published with the support of the Għaqda tal-Malti. The ‘south-up’ orientation of the Mediterranean Sea shown on the cover reveals the shape of a boat – perhaps a bronze-age Minoan sailboat, the first to harness the winds toward new trades with Egypt and Canaan, or perhaps a more modern, ramshackle fishing vessel, with a squeezed cabin, departing from Tangiers, Tunis or Tripoli toward new challenges – and new dangers – further north. Much of the poem is a lyrical development of ideas I first expressed in my introduction to Marco Scerri’s photographic series Distant Land, portraying the everyday life of sub-Saharan migrants living at the Peace Laboratory in Ħal Far. On the 28th, I’ll be reciting the poem with musical accompaniment by Effie Azzopardi (trumpet) and Samwel Grima (bass). English and Italian translations of the poem will be published at a later stage. 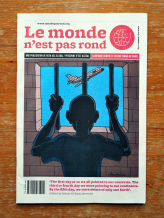 After the trip, as of mid-October, Le monde n’est pas rond, the international magazine on migration, borders, and human rights published in collaboration with Nobody is Illegal – Luxembourg, will migrate from a printed newspaper to a webzine format. The change of strategy comes for practical reasons, and also for the benefit of its readers. New content will be published two to three times a week, with a few surprises up our sleeve; after a year, the best and most popular works will be collected in a printed anthology. Alternative journalism, short stories, poems, photographs, visual art and illustration, reviews, videos and music. The spirit will remain the same: collaboration among artists and writers from different disciplines, in Luxembourg and beyond, in 4 languages, around a common message – a call for softer borders, universal freedom of movement, and respect for human dignity, irrespective of one’s origins, melanin skin content or nation-state GDP. Stay tuned. 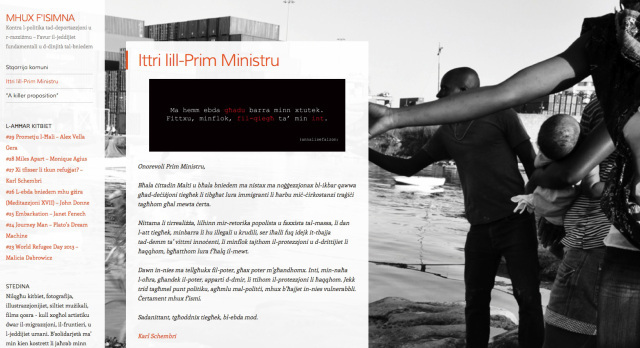 In the mean time, Mhux F’Isimna (Not In Our Name), the Maltese blog against racism and the policy of deportation, continues to welcome articles, stories, poems and other artistic works in whatever discipline, in Maltese or English. Originally created last July in response to the Maltese Prime Minister’s threat to deport a group of Somali refugees to the military airport of Mitiga in Libya (a move subsequently halted by the European Court of Human Rights, thanks to the swift mobilisation of NGOs and lawyers in Malta), Mhux F’Isimna is slowly morphing into an anthology of works on the general themes of migration, diversity and anti-racism. At some point in the future, it would be a nice idea to collect these works as a printed book, following in the tradition begun a few years ago by Adrian Grima and Karl Schembri, with their anthologies on food sovereignty, climate change, and solidarity with the people of Gaza. We look forward to receiving more creative works to add to the 33 posts published so far on the blog. As we say in Maltese, “Tlaqna” – not quite equivalent to “Let’s go”, but closer to “We’ve already left”. September 19, 2013 by Antoine Cassar.